Staunton Virginia boasts an impressive lineup of outdoor entertainment throughout the summer months. No matter which day of the week, you’re sure to find something to enjoy. 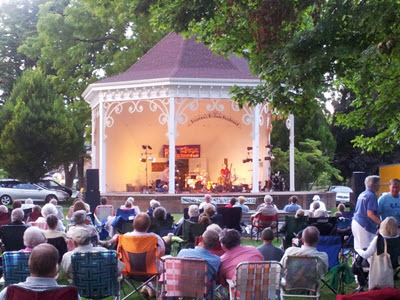 Music lovers of all ages can appreciate the wide variety of groups and styles that are performed each week at Gypsy Hill Park in a free concert. On Mondays, it is the Stonewall Brigade Band, the oldest continuous community band in the nation. Formed in 1855, the Stonewall Brigade Band has had well over 900 members throughout its long history. In a typical concert, you will see between 70 and 80 different performers, with ages ranging from 13 to 84. This is a concert band, with the typical mix of woodwind, brass, and percussion instruments. On Tuesdays, it is Praise in the Park, featuring various Christian groups and styles from around the area. It could be Southern Gospel, Contemporary Christian, or even an all-male a cappella group. Wednesday night is for Bluegrass lovers, or for anyone who enjoys watching fast fingers pickin’ on banjos, guitars, mandolins, and other instruments. On Thursdays, soak in the sounds of Jazz in the Park. You may hear styles from the original roots of jazz all the way to the smooth sounds of modern jazz. One group in particular is billed as doing everything from Miles Davis to the Beatles. Friday nights in the park see a break from music, with family friendly films shown outdoors at the Family Flix Night. This year’s lineup features Frozen, The Hunger Games: Catching Fire, Despicable Me 2, Saving Mr. Banks, Gravity, and The Lego Movie. In addition to the events at the park, Staunton hosts another regular music event called Shakin’ at the Station. This event features a wide variety of local bands, and is held on Thursdays in the Wharf Parking Lot (near the train station) in downtown Staunton. There is a $2 admission fee. Be aware that alcohol vendors will be selling at this event, but the Staunton Police do a great job of keeping the crowd under control so it is still a family friendly experience. Last Thursday, our family attended Shakin’ at the Station to see our friend Alan Good play bass guitar in the funk band Everyday People. The music was great, and before the concert started we decided to grab a bite to eat. There are so many good specialty restaurants in the downtown Staunton area that it was tough to choose just one. We finally settled on Shenandoah Pizza, a quaint little restaurant that we’ve heard good things about. We ordered a large pizza with different halves. One half was called the Nags Header, and consisted of pesto, sun-dried tomatoes, garlic, spinach, broccoli, mushrooms, and red onions. The other half was the Stuart Hall, loaded with bell peppers, red onions, tomatoes, black olives, and by request, the addition of sausage. As you probably noticed, all the pizzas are named after local (or not so local in the case of the Nags Header) attractions or venues. Both halves were fabulous, and we highly recommend Shenandoah Pizza for your next visit to Staunton. Make it an evening of fun food and great entertainment by eating at Shenandoah Pizza, and savoring the sights and sounds of music or movies at one of these outdoor entertainment venues that the City of Staunton provides.